At Kempston Cleaning Services, we pride ourselves on our work and our safety standards. We value your health and safety as well as that of our staff. 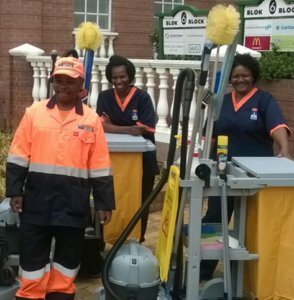 Cleaners are employed in many different types of workplaces, including schools, offices, factories, hospitals, health care facilities and retail outlets. Cleaners employed by private contractors are likely to work in a variety of workplaces, while in-house cleaners usually work in the same environment. Cleaning staff are often employed in workplaces that have been planned with other workers in mind. Therefore, it is important that a risk assessment is completed to identify any hazards which the cleaner may come in contact with in the workplace, and steps should be taken to minimise or reduce the risks from those hazards. What protective measures should be taken when working with chemicals? Cleaning workers may be exposed to many different chemicals during their work and should be made aware of the hazards and the precautions to take when handling chemicals. Employers should make available the risk assessment identifying the hazards in each place of work which cleaners may be working in. This should detail any relevant hazards in it and how workers should protect themselves. Material Safety Data Sheets should be available for all hazardous chemicals and workers should have an understanding of the hazards of the chemicals they are in contact with. Chemicals should have clear legible labels on them, hazard pictograms should be visible and they should be stored in a secure location, where they cannot be accessed by unauthorised persons. Chemicals should be diluted carefully according to manufacturer’s instructions, and workers should be made aware of the danger of mixing incompatible chemicals. Workers should be trained on how to complete their work safely and this may be in the form of documented training and procedures. Workers may be exposed to biological hazards in the form of needle stick injuries, Weil’s disease from rat’s urine, legionella bacteria from stagnant water or asbestos. These hazards should be identified in the risk assessment of the workplace and precautions taken to avoid exposure. symptoms should be identified and reported for follow up to the employer as soon as possible. The next time you see a Kempston Cleaning Services crew at work, rest assured that they are well trained at what they’re doing.